Meet on the first Wednesday of the month at Saxon Hall for 8pm. £3 for members and £3.50 for visitors. Raunds Music Festival is a small, friendly festival, now in its 18th year, run entirely by volunteers. Our passion for music means we bring internationally acclaimed folk and roots musicians (including Blair Dunlop, Belshazzar's Feast, Gilmore and Roberts and The Frank Burfitt Band) to play alongside our local community groups (choirs and music groups) in East Northants. Local musicians and singers have opportunities to participate in the informal Song'n'Tune and Sing sessions and there is a Ceilidh. Our festival runs Thursday to Sunday from May 2nd to May 5th 2019. Tickets are available from Raunds Hardware & Pet Supplies, Brook St Newsagents and the Festival Hotline: 07756 015615 or the Raunds Festival website: www.raundsfestival.com where you can get further details of the programme. Raunds Music Festival May 2nd 2019. Song and Tune Session, 8.00pm hosted by members of Tautas Roks and Ock'n'Dough. A warm and welcoming start to the festival at TheWorld Upside Down, Raunds. Bring your voice, your instrument and join in or just enjoy and listen. All welcome. Free Admission. Raunds Music Festival May 3rd 2019. Friday evening Ceilidh 8.00pm with the music of two local bands, Tautas Roks and Ock'n'Dough. The music is guaranteed to get you on the dance floor! Raunds Music Festival May 4th 2019. Saturday lunchtime concert at 12.30 to 2.45 featuring Raunds Ukulele Orchestra, NMPAT (Wellingborough) and A Different Direction Choir. Saturday Afternoon concert 3.30 to 5.00pm featuring Frank Burfitt Band and Becka Wolfe. Saturday evening concert 8.00pm featuring Blair Dunlop and Gilmore and Roberts. Gilmore & Roberts, combine award-winning song writing with astounding musicianship and their trademark harmonies to create a powerful wall of sound. Katriona Gilmore (fiddle, mandolin) and Jamie Roberts (guitar) have been nominated three times at the BBC Radio 2 Folk Awards. Blair Dunlop is a well-known British singer, songwriter and guitarist, has toured widely around the globe and many of you will have seen him at Raunds with the Albion Band. 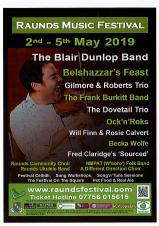 Raunds Music Festival May 5th 2019. A busy day starts with a Lunchtime Song'n'Tune session at The World Upside Down, Raunds. Whether you sing or play an instrument this is your chance to perform in a friendly atmosphere, or just come and listen and enjoy. 12 noon, free admission. New for this year there are singalong sessions for adults and children. The Sunday Afternoon concert features Fred Claridge and the duo Will Finn and Rosie Calvert. 3.00pm to 5.00pm. The Sunday evening concert 8.00pm features the amazing duo Belshazzar's Feast They start with traditional folk music, throw in a bit of pop and music hall, and top it off wry humour for a unique live experience. They are supported by the amazingly talented young musicians Dovetail Trio. Ring 01933 622087 between 9:30 am – 2pm to reserve your seat. This years Raunds Mayor's Show is on Sunday 19th May from 12 noon to 5pm. Good Old Fashioned Fun for the whole family. Our next coach trip will be on Sunday 26th May 2019 to Coombes Valley Staffordshire. HTML5 validated. WCAG compliant. Page generated in 0.0982 seconds.